Hi there; Bob here. Today, I want to show you how to create a contemporary landscape using a few soft colors, graphite, ink, and a couple of different Gelli Arts® gel plates. 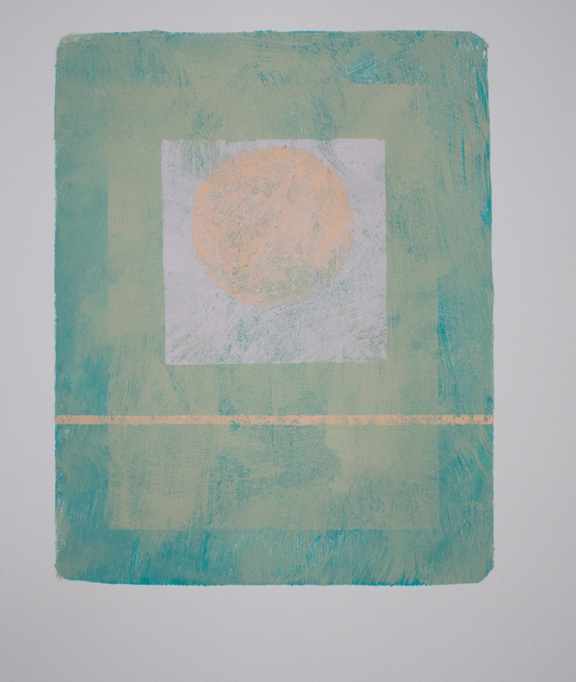 The paint I used here is Golden paints new heavy body colors in Titan Green Pale, Titan Violet Pale, and Light Orange. I also used Golden’s Teal for the background. Since my prints are built from several layers of color each applied individually, I need some sort of system to keep all the printed layers of color in register. My YouTube channel has a brief video about constructing such a registration board. In this picture I’ve lined up the edges of a 8"x 10" Gelli Arts® plate to the board and then cover the wood strips on the board with 2" painters tape. 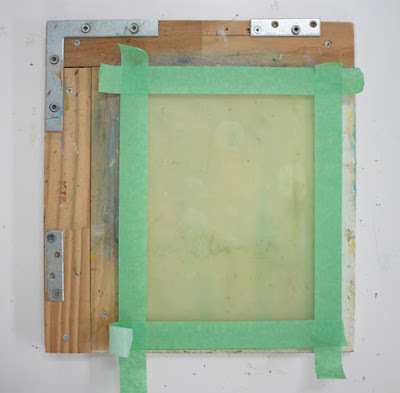 This will protect the wood strips from accidental paint strokes or drips. 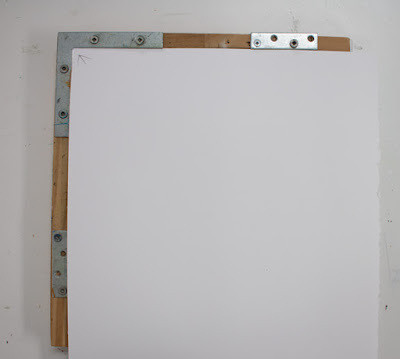 To ensure that your paper isn’t upside down and/or backwards when you print, pencil an arrow into the upper left corner of what will be the back of the print. 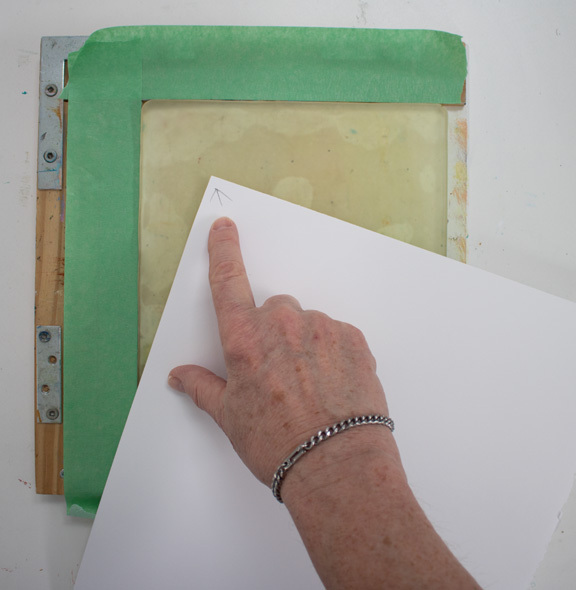 You’ll use that arrow to line up your paper with the metal corner bracket each time you add a layer in your print. 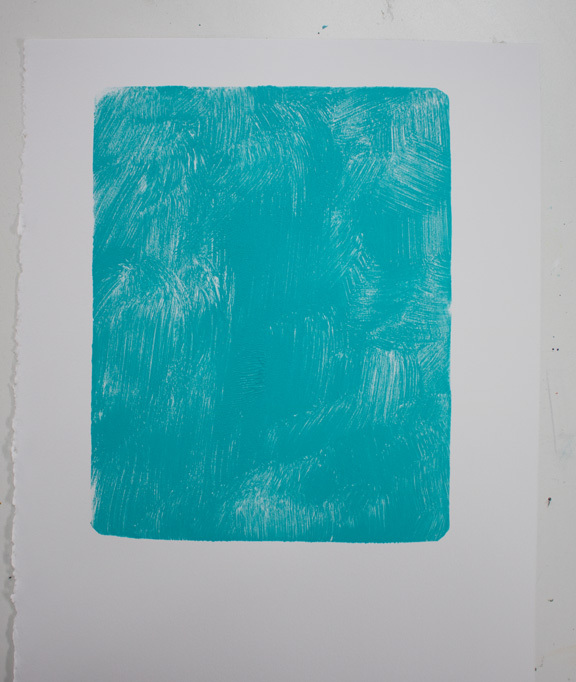 I'm using Teal for the background color. If you are also using fast drying heavy body paints, you might want to add a bit of Golden Open Acrylic Gel Medium to each of the colors you place on the palette. 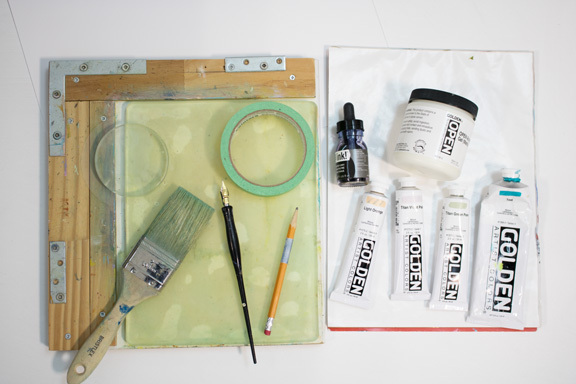 If you add about 20% gel medium to the paint, you’ll slightly slow down the drying time of each color. But the choice is yours. 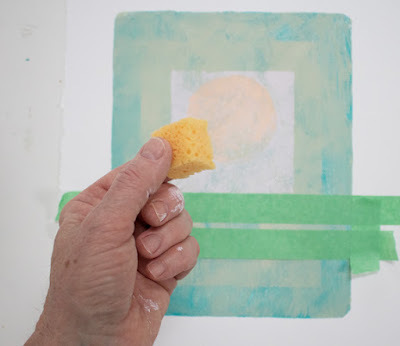 Use a dry, flat, bristle brush to apply color to the plate. The bristles will help create a little random texture in your paint. 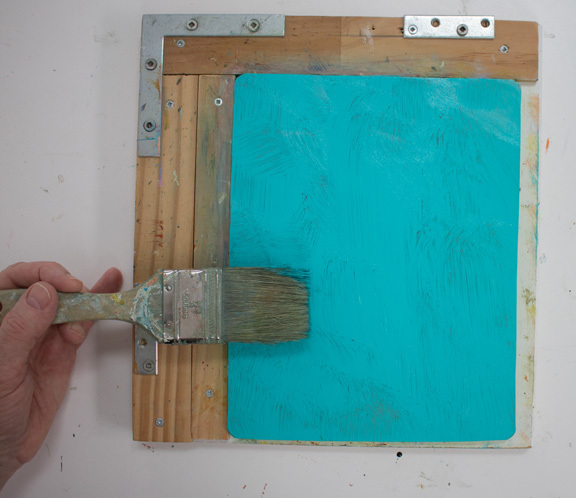 Apply the color to the plate and then remove the painters tape from the wood strips on the registration board. Pull your first print. Make sure the upper left corner of the paper fits into the corner of the angle bracket to ensure registration. 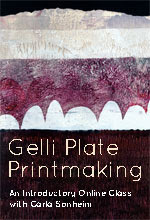 Make sure you don’t move the Gelli Arts® plate between color pulls or the next layer of the print will be off register. 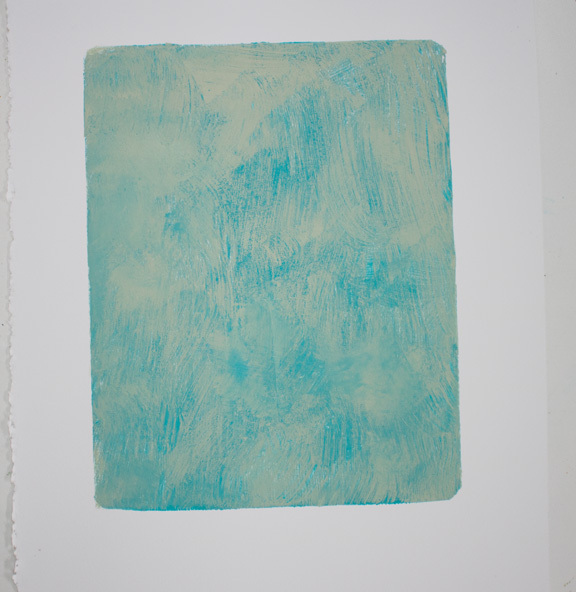 Here’s the first pull of the background color. 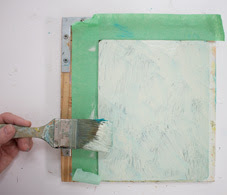 Re-apply tape to the board and brush a thin layer of Titan Green Pale over the entire plate. Remove the tape and pull the print. Here’s what happens: Since you’ll be printing wet paint into wet paint much of the paint applied to the plate is left behind and/or mixed into the initial color leaving you with a soft, visually textured background. 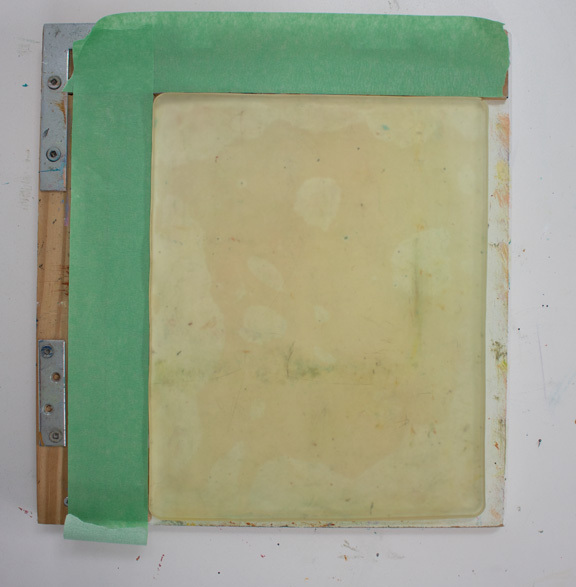 Apply 1" painters tape around the inside edge of the plate, apply Titan Green Pale to the exposed area, remove the tape and print. 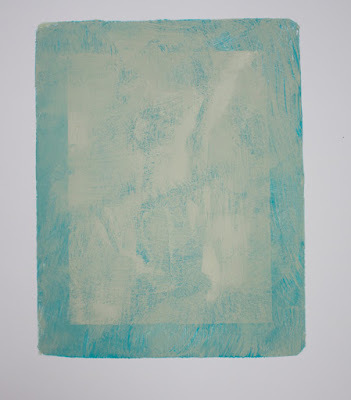 You should get a defined rectangle of lighter color over the background. If the light color doesn’t show, you could either reprint that color or use a paint brush to add a little more paint to the rectangle on your print. 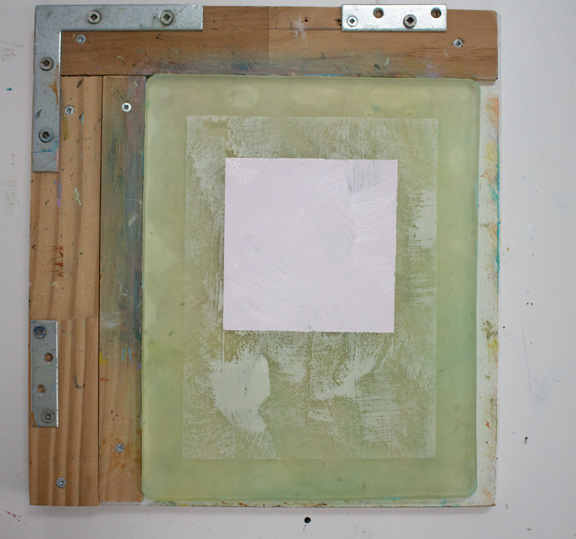 Tape off a 4" square a couple of inches below the top of the plate. Brush on a thin layer of Titan Violet Pale. Remove tape and pull the print. Brush a thin layer of Light Orange onto a 3" round Gelli Arts® plate and press the round plate into the violet square on the larger plate. Pull the print. 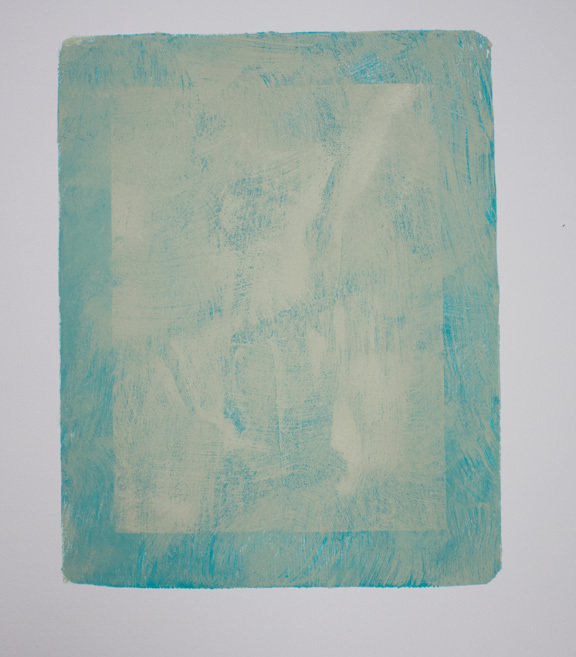 Tape off a skinny line towards the bottom of the print (not on the gel plate). 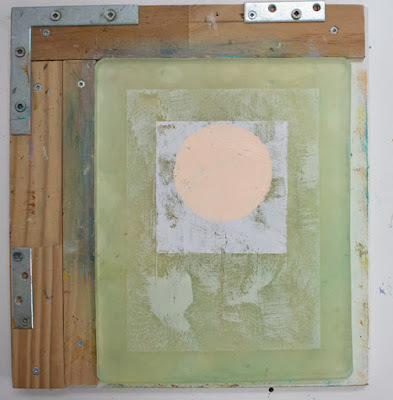 Using a soft sponge, tap Light Orange paint into the open space between the pieces of tape. This sponge is a piece cut from a grouting sponge. 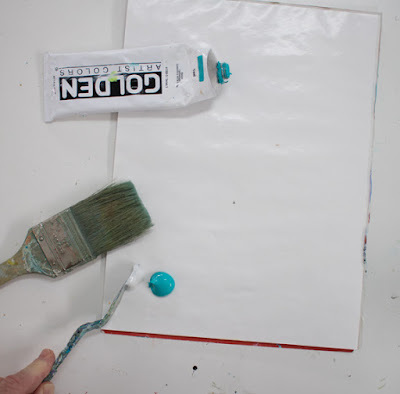 Remove the tape and you have your finished print. Now, you just need to add some details. 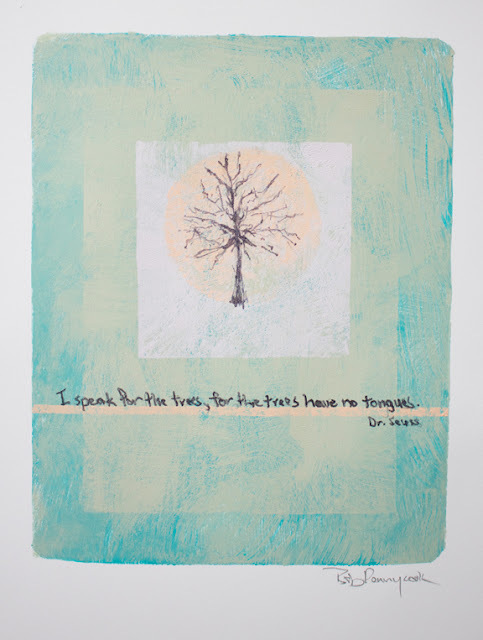 I drew the tree and added the lettering with HB pencil then I went over the pencil lines with a nib pen and acrylic ink. 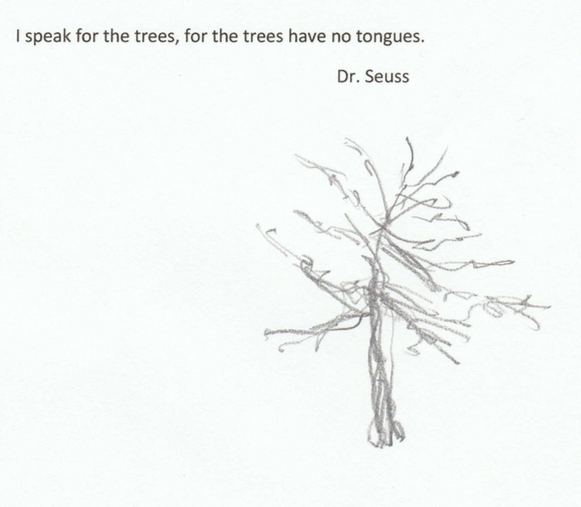 Here is a photo of the tree design and quote by Dr. Seuss if you would like to use them in your print. 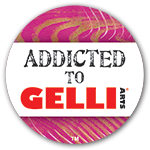 I gelli print a lot but never with such intention. I shall be trying this because I love the final piece. Thanks! Great project and wise subject - win, win. Your little landscapes are delightful! Wonderful tutorial. Clearly explained, with helpful images. I can't wait to try it myself. WOW...what a WONDERFUL, detail post!!!! This is a 'keeper' to bookmark!!! Thanks so much...off to check out some of your videos!! !